We are so very lucky that we can send the kids to play outdoors most of the year. We have reached that stage of the year, however, where us tender Texans retreat indoors. Need an up-to-date list of all the places you can play indoors here in our town? Here you go! Art Garage Austin (11190 Circle Dr., Suite 202) – The Art Garage is a walk-in art studio offering over 250 items for paint-your-own pottery, clay projects, mosaics, fused glass and fire and fill candles. Austin Public Library branches (view interactive map of all locations here) – Of course, this isn’t the place to take kids to let off some steam, but you can still spend some time at your local library branch checking out books or taking advantage of all the youth programming. BlazerTag (1701 Ben White Blvd.) – Kids 7 and up can enjoy three stories of towers and ramps while they try to “tag” opponents with a visible laser light beam to score points. BlazerTag also has an arcade and SkyTrail, which is a ropes course 20 feet above the arcade. Cafe Monet (4477 South Lamar Blvd., Suite 560; 4700 Guadalupe, Suite 11; 145 E. Hopkins St. San Marcos) – Cafe Monet is a paint-your-own pottery and mosaic studio where you can create fully functional, personalized pottery, fused glass and mosaics for your home or as gifts. Dart Bowl (5700 Grover Ave.) – Dart Bowl has 32 lanes, automatic scoring, bumper bowling for small children, arcade games, a new Laser Maze and a full service cafe and bar. Hop N Happy (10401 Anderson Mill Rd., Suite 110A) – Hop N Happy is an inflatable playground with open play for toddlers through kids 10 years of age. Hoppin’ House (4040 South Lamar Blvd., 5151B Industrial Way, Buda) – Hoppin’ House is an indoor inflatable playground with a foam pit. Inflatable Wonderland (Lakeline Mall in Cedar Park between Dillards and Sears: 11200 Lakeline Mall Dr.) – Inflatable fun for kids 10 and under. All day passes have “in and out” privileges. Open during mall hours. 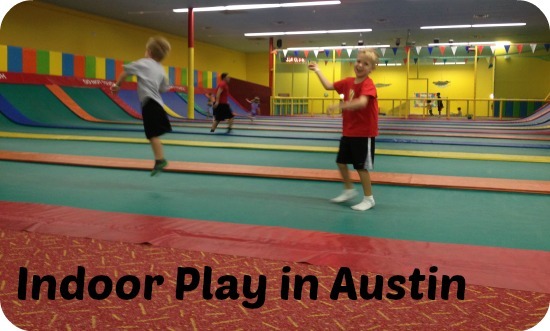 Jumpoline (13801 Mopac Expy., 6405 South IH-35) – Jump on wall-to-wall trampolines, play dodge ball in a set-aside area or have the little ones enjoy their own play area with trampolines and inflatables. Parents can have as much fun as the kids! Jumpstreet (Lakeline Village Shopping Center in Cedar Park next to Jazzercise: 12617 Ridgeline Blvd., Suite B) – Kids (and adults) can jump on the trampoline court, play dogeball or hang out in the arcade area. Littler ones can play in the “Earthquake” Kids Zone. You can also purchase a Fun Pass at an additional cost to use the foam put, snow slide, maze and mechanical bull. Jump USA Park (10601 N. Lamar Blvd., Suite D) – Jump USA consists of uniquely designed gigantic trampolines, nicely decorated private party-room sections, gaming areas, snack/merchant corners, waiting areas and inflatables/trampoline for younger children. No outside food or drinks allowed. Must wear socks at all times. You can pay extra to enter the Zorb Water-Ball Park. Locomotion Inflatable Play (6800 Westgate Blvd.) – As the name suggests, Locomotion has inflatables, a kid’s play town featuring a pretend animal hospital, diner, movie theater, grocery store and building workshop. There is also an animal stuffing station and a separate infant/toddler area. Millenium Youth Entertainment Complex (1156 Hargrave St.) – The MYEC has roller skating, bowling, a movie theater, arcade and a food court. The facility is open Wednesdays, Thursdays, Fridays and Saturdays. Mt. Playmore (13609 North IH-35, Bldg. 3) – Features a Texas-sized indoor play structure measuring 120 feet by 60 feet and nearly 20 feet tall, an arcade, kiddie rides and a toddler area. Museums (various) – There are plenty of museums your family can explore indoors, such as the Bullock Texas State History Museum, the Blanton Museum of Art and the Texas Memorial Museum. The Austin Museum Partnership which sponsors Austin Museum Day each year has a list on its website. Pinballz Arcade (8940 Research Blvd., Suite 100) – Family-friendly arcade with the largest number of pinball machines in Texas. Game selection includes pinball machines, classic and new video arcade games, shooting games, driving games, instant prize and ticket redemption games, air hockey, basketball, skee-ball and touch screen games. Pump It Up (9330 United Dr., Suite 180; 3918 Gattis School Rd., Suite 100, Round Rock) – Pump It Up has Open Jump times when visitors can play on various inflatables, including the all-famous slide. There are also riding and push toys for littler ones as well. Safari Champ (1400 East Old Settlers Blvd. #200, Round Rock) – Safari Champ is an indoor playscape with slides, tunnels, ropes, a zip line, small basketball court and a separate toddler area. Parents can also play along, if they want. Texas Military Forces Museum (Camp Mabry: 2200 West 35th St.) – This free museum houses over 10,000 three-dimensional artifacts; 6,000 books; 20,000 historic photographs and more than three dozen historical military vehicles and artillery pieces. Exhibits include artifacts from World War II, the Cold War and the Global War on Terror, among other military conflicts. Don’t forget that a photo I.D. is required for all adults to enter Camp Mabry. Thinkery (1830 Simond Ave.) – If you haven’t been to the “new” children’s museum here in Austin, definitely put it on your list. More offerings for older kids and lots of options for the littles as well. Make sure to read Skye’s post on the new exhibit, Junk City. Toybrary (7817 Rockwood, Suite 101) – Toybrary is a toy lending library for children ages 6 months to 5 years old. Your children can also “Stay & Play” for $5 per child in the play area, which includes tents, costumes, little bikes, a train table and more.